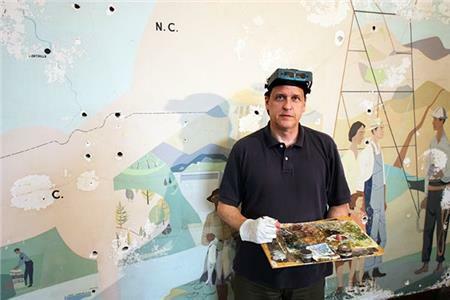 An art conservator who can count a Rembrandt painting among his many restoration projects is now working to save a mural at Norris Dam. The severely damaged artwork was discovered behind a dated gold-colored shag rug bolted to the powerhouse lobby wall during preparations for the plant’s 80th anniversary celebration in 2016. The mural—painted by TVA artist Robert Birdwell in the 1950s—tells the story of how the Tennessee River was tamed to serve the people of the Valley. The problem, however, was that thousands of flakes were either missing or peeling away from the painting, while more than a hundred half-dollar-sized bolt holes dotted Birdwell’s work. Michael Ruzga, chief conservator and project manager of Fine Art Conservation Inc., was chosen to try to save the mural. Ruzga estimates it will take him and his team of skilled artists and chemists about 200 conservator days to restore the work to its original state. Mr. Ruzga and his team’s techniques include filling each bolt hole with polyethylene plugs and painstakingly reattaching each tiny paint flake back to the mural. Ruzga has a box filled with flakes, and the task is like solving a 30-foot jigsaw puzzle. TVA Federal Preservation Officer and Senior Program Manager Pat Ezzell has spearheaded the restoration project since the beginning. She first learned of the mural through a picture sent to her by the facilities team who removed the dated rug from the wall. “I was elated,” Ms. Ezzell says. TVA Architect Janine Obenschain had a similar response to the discovery. The restoration is expected to be completed next month. For more information about the artist, Robert Birdwell, and his work click here.